Here’s the problem. While encryption is in a way just transforming one block of data reversibly into another, that process is actually pretty complicated. Math needs to be done, data read and written and reread and rewritten and confirmed and hashed. For a text message that’s not so hard. But if you have to do the same thing as you store or retrieve megabyte after megabyte of data, for instance with images or video, that extra computation adds up quick. Lots of modern smartphones and other gadgets are equipped with a special chip that performs some of the most common encryption algorithms and processes (namely AES), just like we have GPUs to handle graphics calculations in games and such. But what about older phones, or cheaper ones, or tiny smart home gadgets that don’t have room for that kind of thing on their boards? Just like they can’t run the latest games, they might not be able to efficiently run the latest cryptographic processes. They can still encrypt things, of course, but it might take too long for certain apps to work, or drain the battery. Google, clearly interested in keeping cheap phones competitive, is tackling this problem by creating a special encryption method just for low-power phones. They call it Adiantum, and it will be optionally part of Android distributions going forward. The technical details are all here, but the gist is this. Instead of using AES it relies on a cipher called ChaCha. This cipher method is highly optimized for basic binary operations, which any processor can execute quickly, though of course it will be outstripped by specialized hardware and drivers. It’s well documented and already in use lots of places — this isn’t some no-name bargain-bin code. As they show, it performs way better on earlier chipsets like the Cortex A7. The Adiantum process doesn’t increase or decrease the size of the payload (for instance by padding it or by appending some header or footer data), meaning the same number of bytes come in as go out. That’s nice when you’re a file system and don’t want to have to set aside too many special blocks for encryption metadata and the like. Naturally new encryption techniques are viewed with some skepticism by security professionals, for whom the greatest pleasure in life is to prove one is compromised or unreliable. 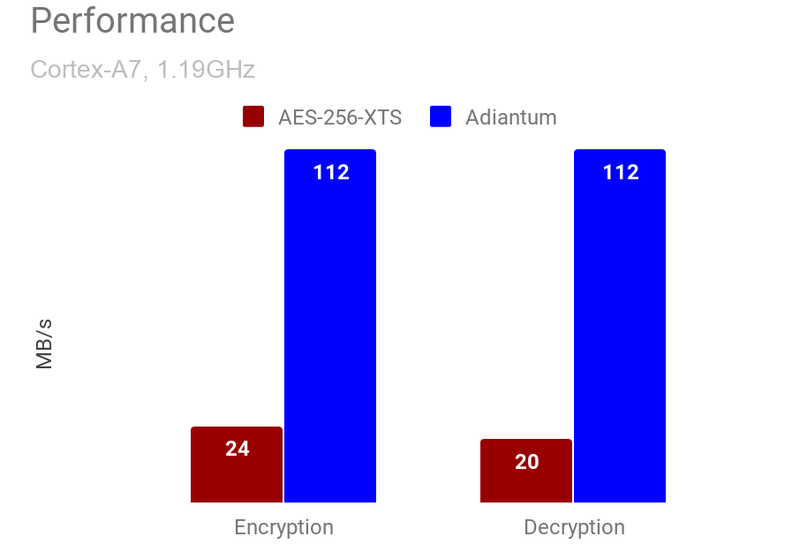 Adiantum’s engineers say they have “high confidence in its security,” with the assumption (currently reasonable) that its component “primitives” ChaCha and AES are themselves secure. We’ll soon see! In the meantime, don’t expect any instant gains, but future low-power devices may offer better security without having to use more expensive components — you won’t have to do a thing, either. Adiantum is named after the genus of the maidenhair fern, which in the Victorian language of flowers (floriography) represents sincerity and discretion.